I will save you in the midst of your troubles. Though I walk in the midst of trouble, you will revive me. 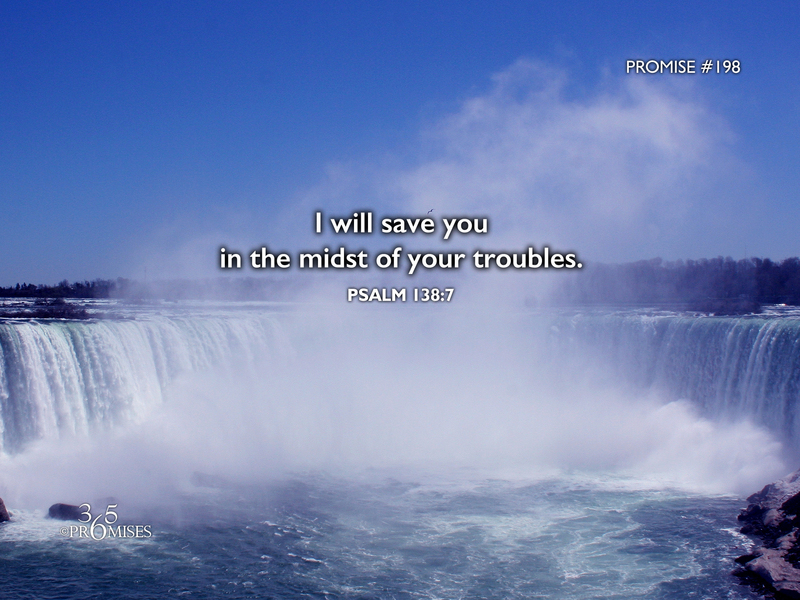 I took the photo for this promise at the Horseshoe Falls in Niagara Falls, Canada. I chose this particular photo because it represents an overwhelming sense of being surrounded by an unstoppable, never-ending power. I imagine being in the center of this torrent of water while I am engulfed by the power of the rushing water around me. In this promise, the psalmist declares that though he walks in the midst of trouble, God's right hand will reach out and save him from his enemies. God is mighty to save us and will quiet us with His love (Zephaniah 3:17). We can rest in this. No matter what your circumstances are, no matter how insurmountable the odds, God promises to save you in the very midst of your troubles! My encouragement today is for you to lean into your Heavenly Father's comforting breast, feel His big strong arms wrap around you just like the rushing waters of Niagara Falls and watch Him come to your rescue. That is what fathers do. They protect their children in the midst of their troubles. God really is the best Dad ever and He will reach out with His mighty right hand and save you in the midst of every circumstance.